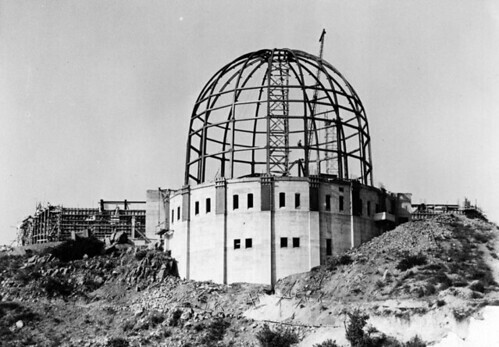 The notion of building an observatory in Griffith Park goes way back to 1903, at least. 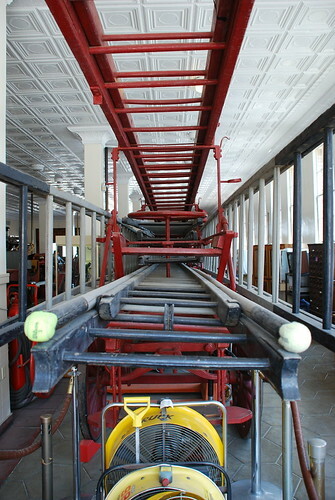 That’s when Colonel James W. Eddy – the same man responsible for Angels Flight – obtained the rights to build a similar funicular railway in the park. 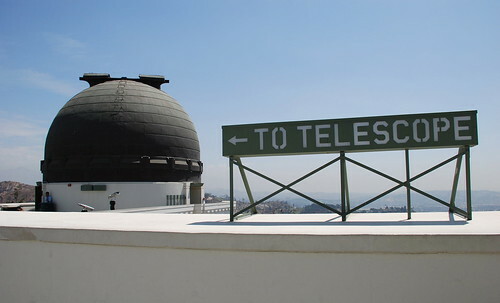 It was his plan to have the tracks lead to an observatory at the peak of Mt Hollywood. That didn’t happen, of course. 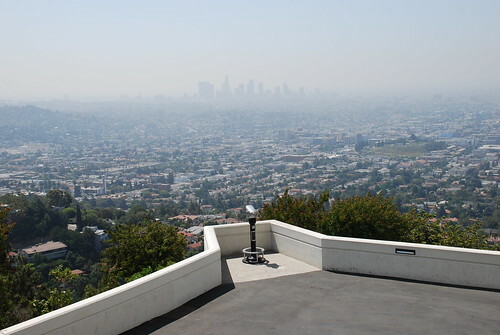 In December 1912, Colonel Griffith J. Griffith, the same man who, at Christmastime in 1896, donated 3,015 acres of land for his namesaked park, pledged $100,000 for an observatory – again, atop Mt Hollywood, the park’s highest peak. The Colonel’s record of philanthropy notwithstanding, and despite his well-documented inspiration when visiting the observatory at Mt Wilson, many saw the offer as an act of redemption for the whole “shooting-his-wife-in-the-eye-incident” in 1903 (she lived, and G.J.G went to prison for a couple of years). 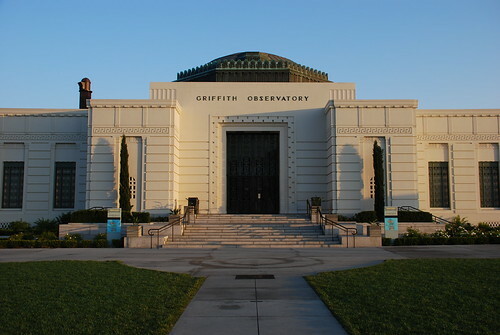 Griffith was truly jazzed about the project, though, planning the observatory with a Hall of Science, rooftop promenade, movie theater, and solar telescope. The problem, though, was city council said ‘no thanks’ to the Colonel’s offer. 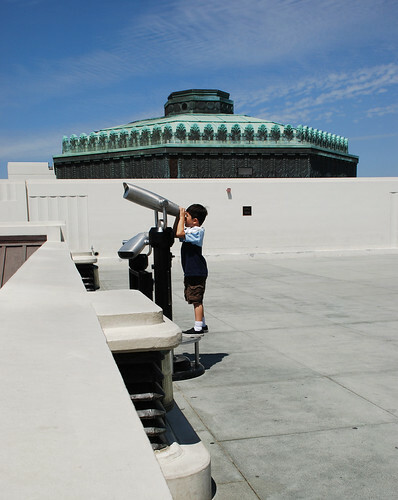 They city even briefly reconsidered Col. Eddy’s decade-old plans for a much larger observatory. The three domes are pure copper. Colonel Griffith died in 1919, never getting to see his hopes for a park observatory fulfilled. 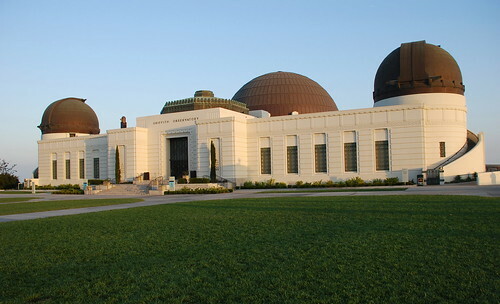 He did, though, will funds for the building of both the Observatory and the Greek Theatre. 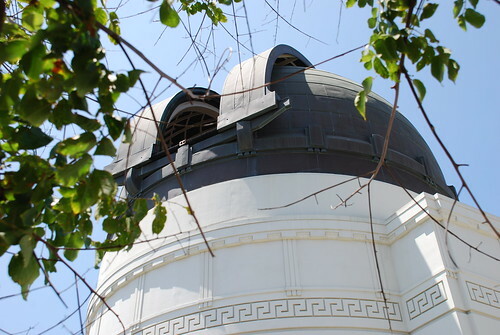 Legal problems with the will ensued, of course, and, by 1930, the Greek was complete, but the Griffith Trust had yet to break ground on the observatory. 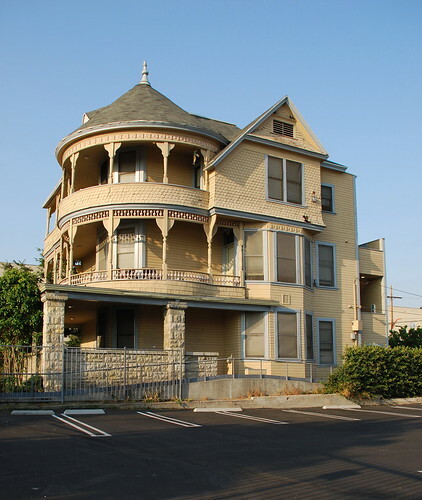 When planning began in earnest (by which time Griffith’s bequest had grown to $750,000), the Trust brought in Caltech physicist Edward Kurth to draw up preliminary plans with the help of Russell W. Porter. 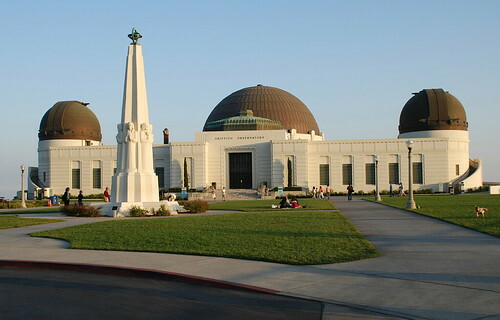 In May of 1931, the Griffith Trust and L.A. Park Commissioners chose architects John C. Austin and Frederic M. Ashley to oversee the final plans for the new observatory building. Austin and Ashley hired Kurth to direct the project with Porter as consultant. 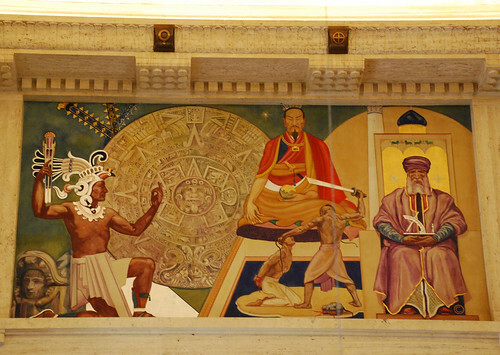 The top picture from the L.A. Public Library. In the bottom shot, look how many people came to watch me take pictures. Further planning included updating Griffith’s idea of a movie theater to a planetarium and buying a twelve-inch refracting German Zeiss telescope ($14,900) along with another pair of telescopes, one of which was a three-in-one solar device. 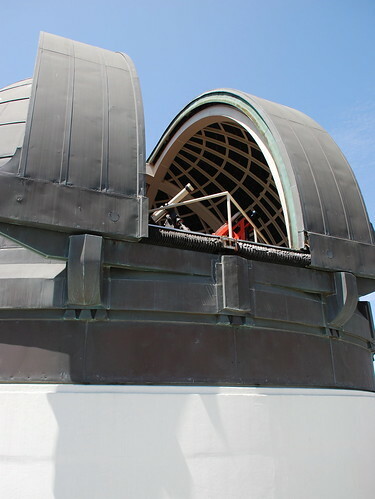 A glimpse of the Triple Beam Coelostat which reflects sunlight to the solar telescopes. 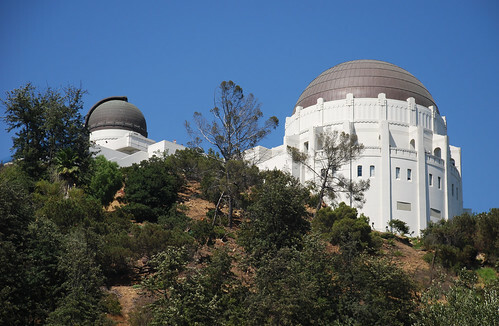 Griffith’s original vision placed the observatory on the peak of Mt Hollywood, but it became apparent that the cost of that location – as well as its accompanying logistic and safety problems – would prove that vision unfeasible. 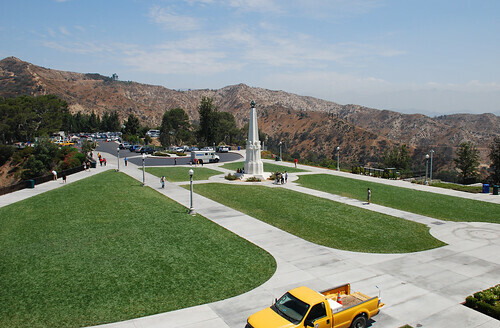 Officials wisely moved the site of the observatory from the top of Mt Hollywood to the hill’s southern slope. 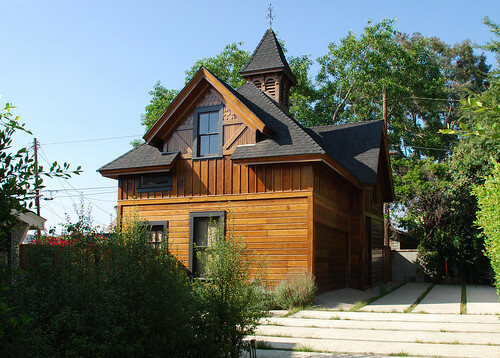 Once that decision was made, architect Austin finished his plans within six weeks. Ground-breaking ceremonies were held on June 20, 1933, with Mayor John C. Porter getting dibs on the first spadeful. Construction began on October 7. 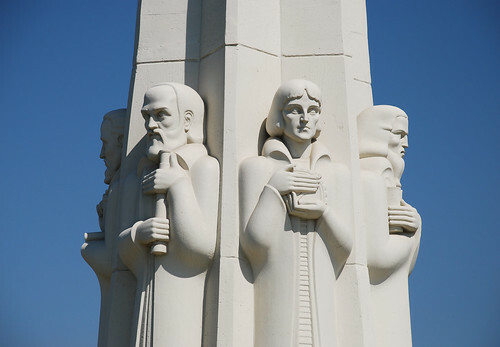 About half a year before the Observatory opened, on November 25, 1934, officials dedicated the forty-foot Astronomers’ Monument on the lawn in front of the unfinished building. A couple thousand people, including Mayor Frank L. Shaw and Governor Frank Merriam, showed up for the ceremonies. The monument was a WPA project conceived by Arnold Foerster and executed by Foerster and five other artists. It features Hipparchus, Copernicus, Galileo, Kepler, Newton, and Herschel. 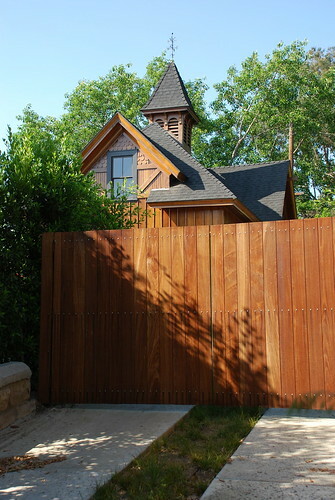 At a total cost $655,000 (cheap! 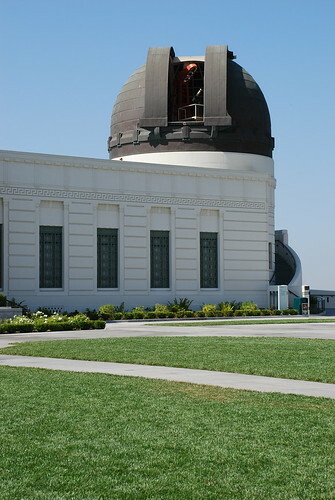 ), the Observatory formally opened on May 14, 1935 with a special reception for a crowd of about 500. 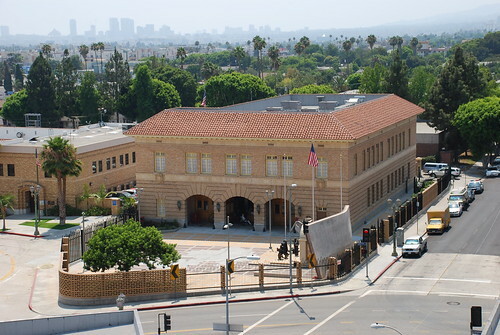 The building was officially presented to Mayor Shaw, the city of L.A., and the Department of Parks (now known as the Department of Recreation and Parks) by Bruce H. Grigsby on behalf of the Griffith Trust. The next day, the doors were thrown open to the hoi polloi. Dr Dinsmore Alter was the observatory’s first director, holding down the job until 1958. 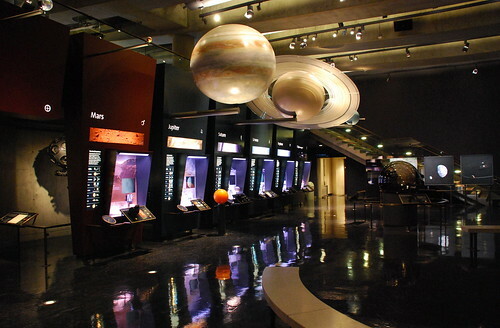 The planetarium – the country’s third – was a big hit, what with it’s 75-foot diameter ceiling and all. 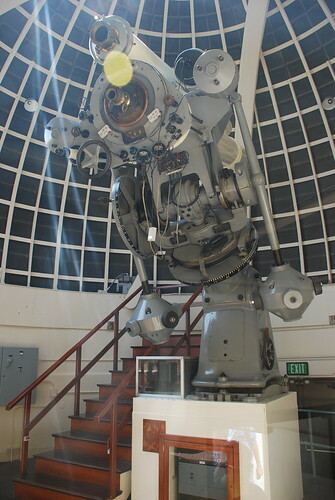 The planetarium’s original projector was used until 1964 when it was replaced by the one below (which saw service until 2002). 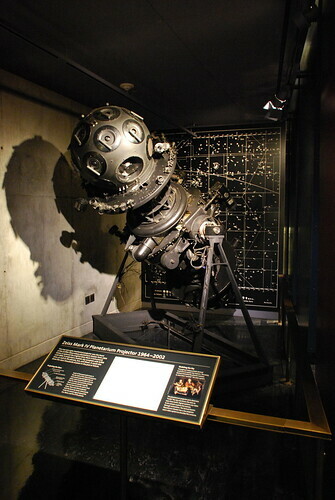 The one below – a one-ton opto-mechanical projector – used a pair of thousand-watt lamps to project 8,900 stars as well as the planets, Sun, and Moon. 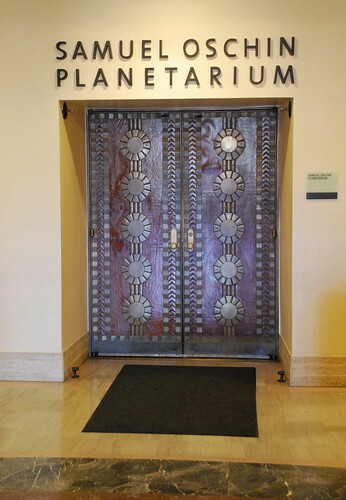 Today, the 300-seat theater is the Samuel Oschin Planetarium. 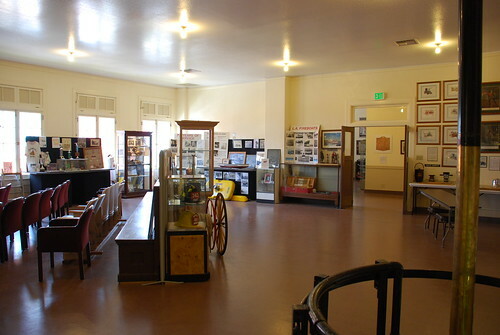 Inside the main entrance is the W.M. 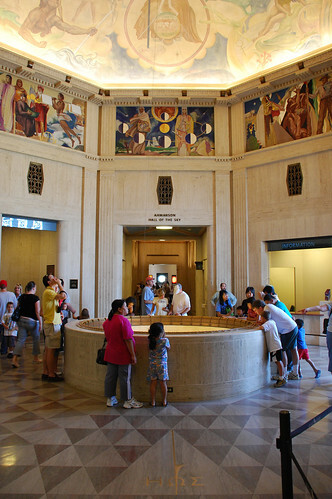 Keck Memorial Foundation Central Rotunda, decorated with the works of movie director/art director/1932 Olympics-medallion-designer Hugo Ballin. Ballin, also responsible for murals at the Wilshire Boulevard Temple, Burbank City Hall, and the Title Guarantee Building, was given an $8,000 commission to create eight 11x16 foot panels plus the ceiling’s painting, thirty-six feet in diameter. 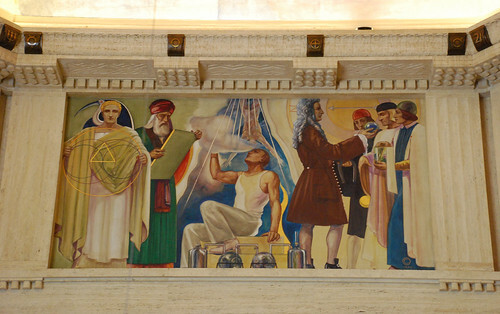 The octet of murals represents the sciences. 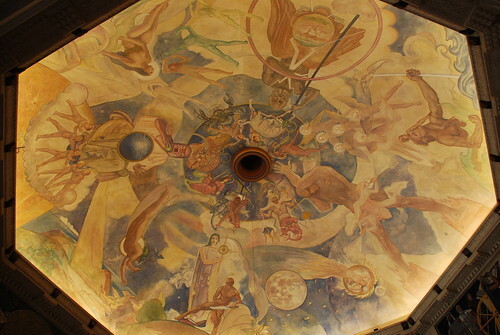 The ceiling art features the Zodiac and stars Atlas along with the Roman gods who got planets named after them. 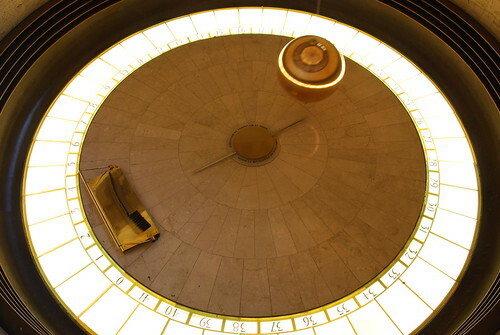 Hanging from the center of the rotunda is the Foucault Pendulum, a 240-pound ball at the end of a forty-foot steel wire. The ball moves in the same direction, it’s the earth that’s rotating under it. It takes forty-two hours for the pendulum to appear to make a full rotation (but it’s actually the planet that’s doing the moving, remember, thanks to the Coriolis force). 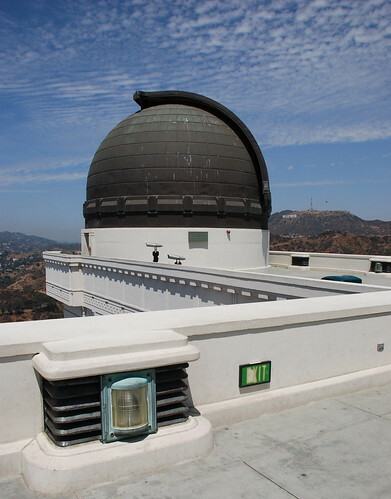 By 2002, with about two million visitors annually, the Griffith Observatory shut its doors for what turned out to be a nearly four-year, $93 million restoration/renovation. Rather than spread out or up, the project’s architects, Stephen Johnson of Pfeiffer Partners and Brenda Levin, decided to dig down. 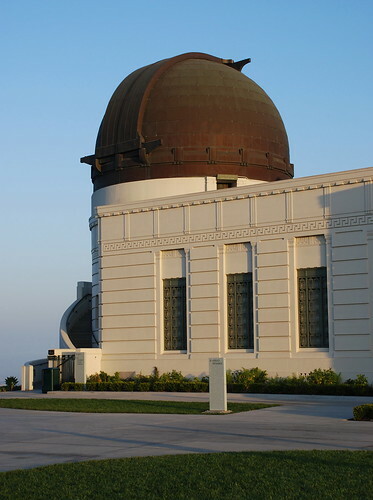 30,000 cubic yards of earth were removed to give the Observatory nearly 40,000 more square feet to play with. Included in the new, lower level are the Leonard Nimoy Event Horizon Theater and the Gunther Depths of Space Exhibit (below). 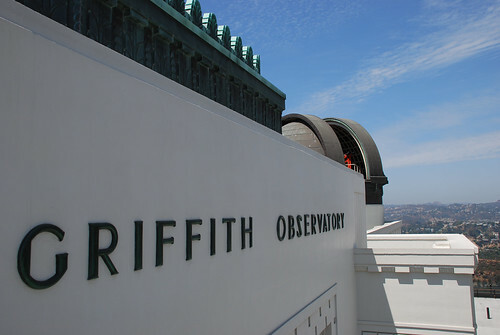 The Griffith Observatory re-opened on November 3, 2006. One last note. 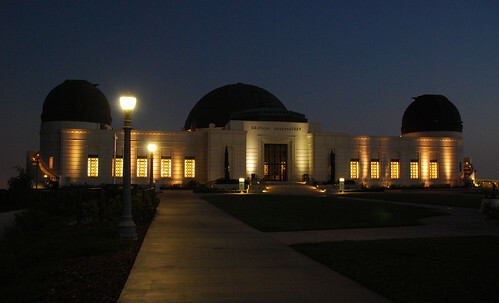 Just two months before the grand re-opening of the Griffith Observatory, Kenneth Kendall passed away at the age of 84. 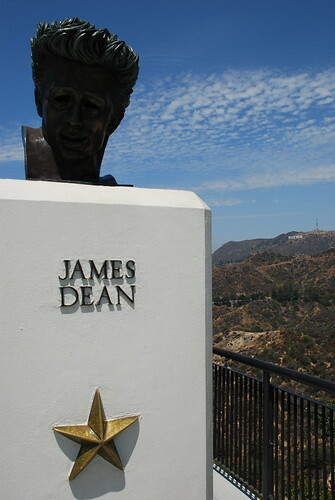 He was the native Angeleno who created the bronze bust of James Dean at the actor’s request back in 1955. 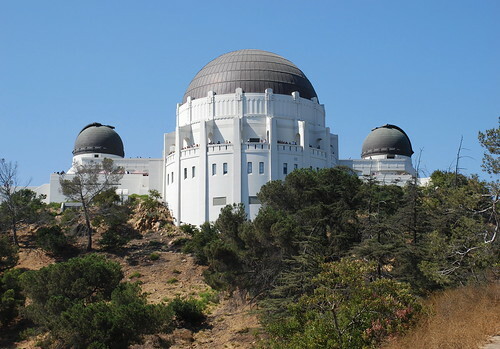 Kendall held onto the sculpture for thirty-three years, but, in 1988, donated it to the Observatory, where a pair of Rebel without a Cause scenes were filmed (here's one). 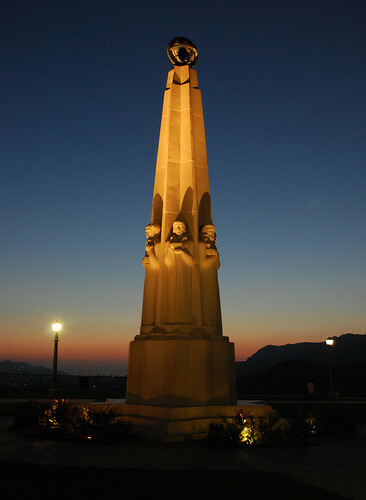 The monument was unveiled on November 1. 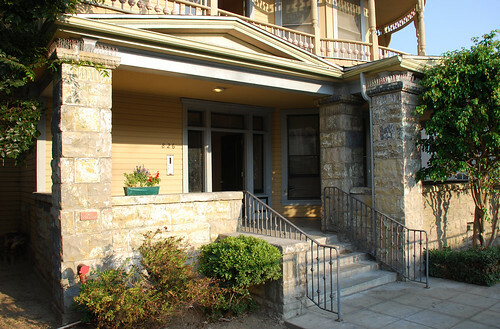 Well, let’s all be thankful this 1887 home was moved from its original location on West 15th Street downtown. Had it not been relocated, it’d have been squished by the Los Angeles Convention Center. 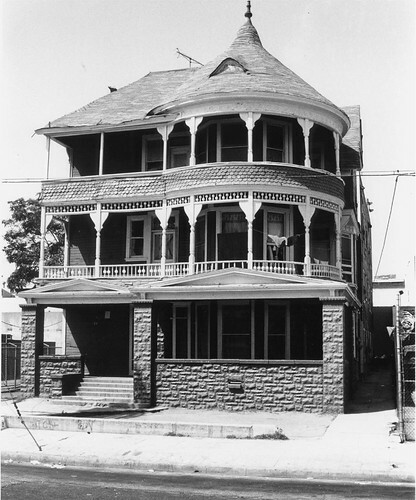 The first known resident of the home – back when it was at 633 West 15th Street (although, up until 1890, the street was named Adele Street) – was salesman Edward A. Strong (what in the hell was he selling to afford such a place, I ask you). The property, part of the Harvey tract, had been owned by hotshot attorney Henry W. O’Melveny. It was subdivided in 1886. 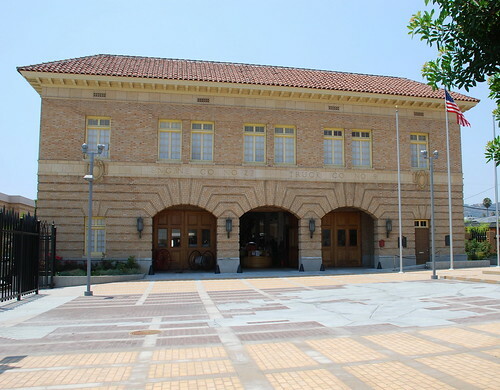 Jumping ahead a century, in 1988, the Community Redevelopment Agency was threatening to raze the home to make way for the $390 million expansion of the Convention Center. 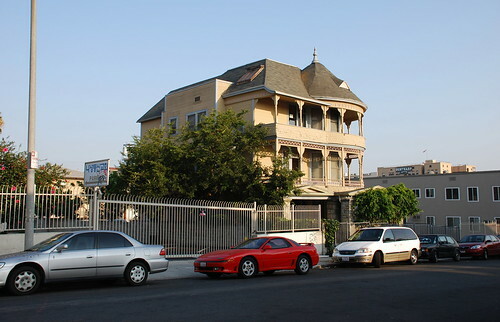 A month away from demolition, the three-story building was finally saved, however, when the city moved it in May 1989 to its current plot, offered by the Department of Water and Power, on South Coronado, about a pair of blocks from MacArthur Park. Architects Tom Micahli and Barry Milofsky did such a superb job transforming the old building into half a dozen “very-low-income” units, the city awarded them with a Historic Preservation Award in 1992. 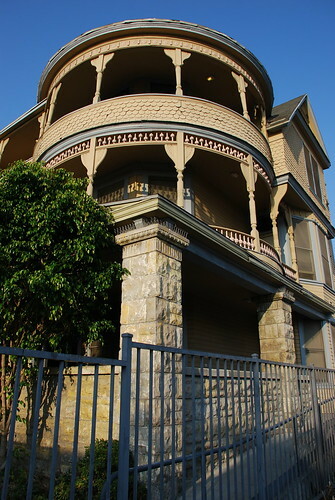 I've read in a few places the ol’ Strong House is very Queen Anne-ish with elements of Caribbean and Craftsman styles, but I sure don’t know which bits are Caribbean, and I’m unaware of any Craftsman details used way back in 1887. 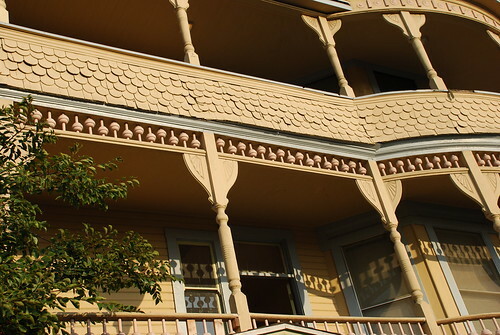 In reviewing the property for Historic-Cultural status, the city pointed out a variety of notable features, including the roof that’s “punctuated by a blind eyebrow window” (I get why it's called that). In some of these shots, you can make out pretty well the later addition to the building's backside. It looks to be in great shape. 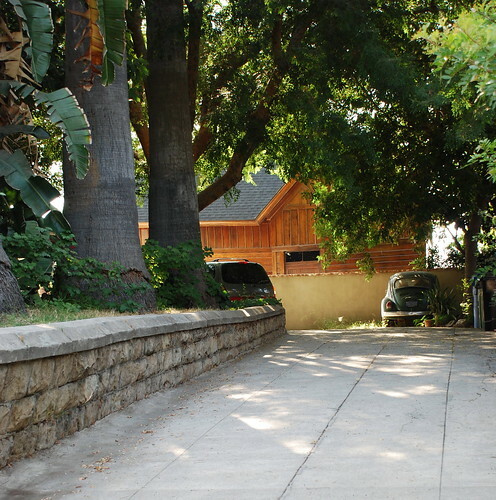 As is often the case, the landscaping could be changed to better show off the home, but that’s a quibble. I’m glad it’s sill around. Who knows, maybe fifty years from now the house will have different, architecturally sympathetic neighbors, or maybe it’ll even be relocated again. 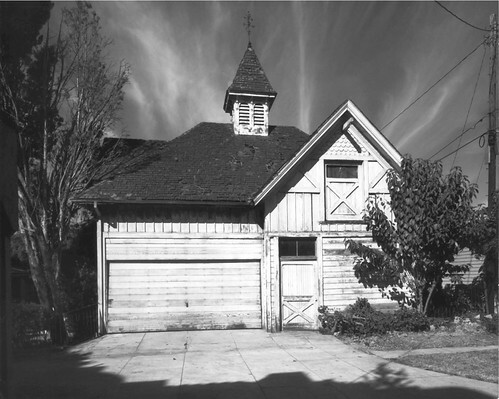 This Victorian-era carriage house originally served Everett E. Hall, co-subdivider of Angelino Heights, and his home around the corner on Douglas Street (HCM No. 216). Today, it’s property of 1417 Kellam Avenue. As such, it’s up for sale. 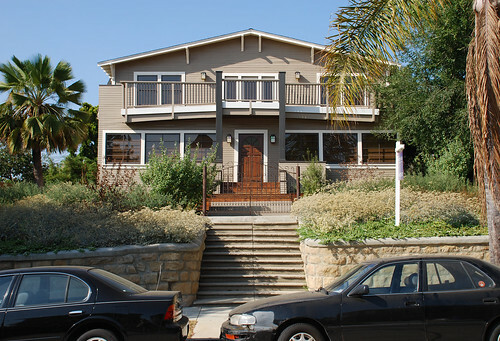 1417 Kellam, located in historic Angelino Heights and pictured above, is being offered for a cool $1.25 million. I’m not crazy about the way the main house (not part of the designated landmark) was renovated. I bet it was a very cool Craftsman at one time. 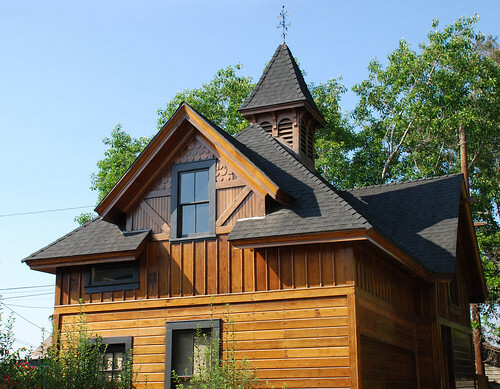 Today, the old carriage house is a guesthouse. Below is the view of it from Douglas. It’s pretty easy to imagine how you’d steer your horses up this path from this angle. That’s it. Quickest post ever. * You can always click here to see the city’s shots of nearly all its Historic-Cultural Monuments. Fire Station No. 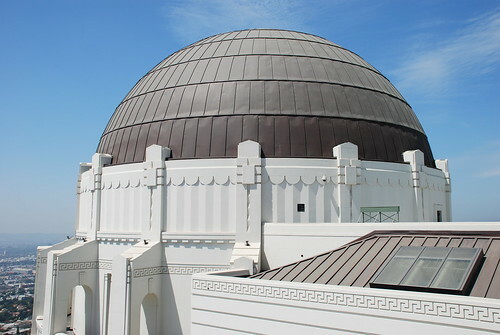 27, the Los Angeles landmark, opened on July 1, 1930. 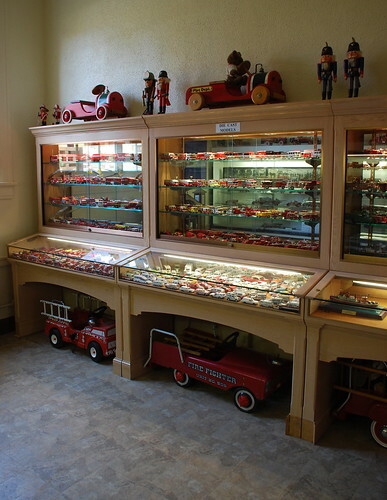 Its 18,227 square feet made it the largest firehouse west of the Mississippi. It didn’t take long for the new No. 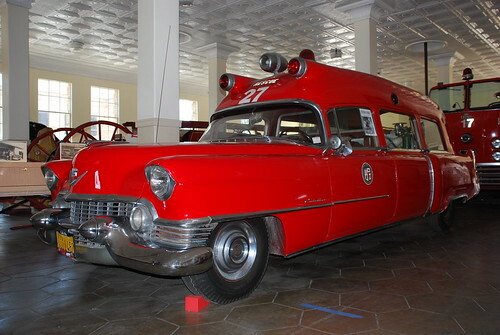 27’s first emergency response, either – there was a hotel fire at 6724 Hollywood Boulevard that very afternoon. Turns out the occupants took care of the fire themselves, though. 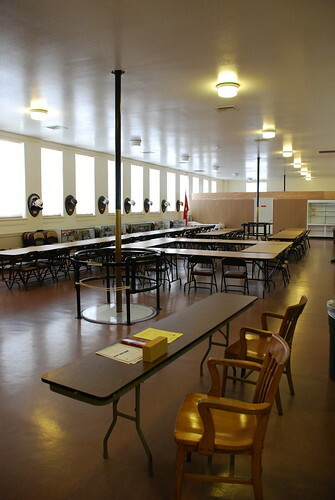 Top to bottom: locker room, dormitory, rec center. 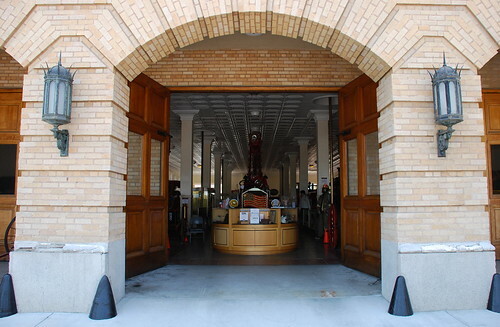 Peter K. Schabarum designed the two-story, brick building with its tiled roof and three apparatus bays. The station, including land and construction, cost around $178,000. 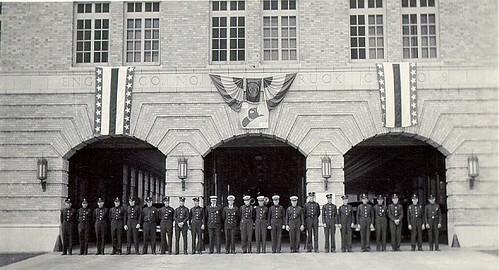 The new firehouse was dedicated with a day and night of celebrating on March 16, 1931. Thanks to the Los Angeles Fire Department Historical Archive for the B&W shot. Flash forward more than half a century. While a brand new No. 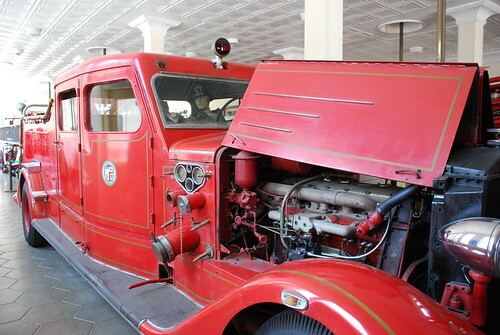 27 firehouse opened next door in 1992, it took another nine years for the city to restore fully the 1930 building (thanks, Northridge earthquake), converting it into the L.A. Fire Department Museum. It opened in October 2001. 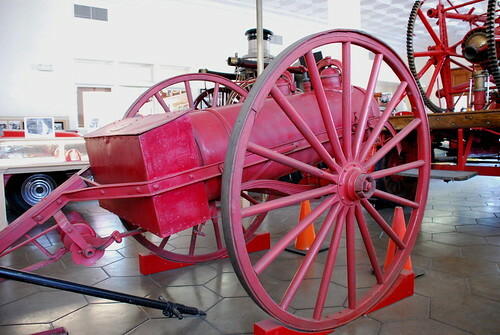 Top: The LAFD's first fire engine. 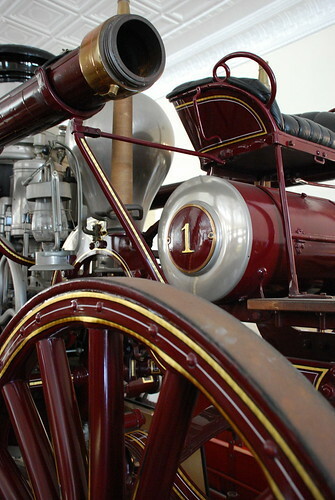 An Amoskeag Steamer, AKA the Kuhrts Steamer, ordered in 1886 and named after former volunteer fire chief Jacob Kuhrts. 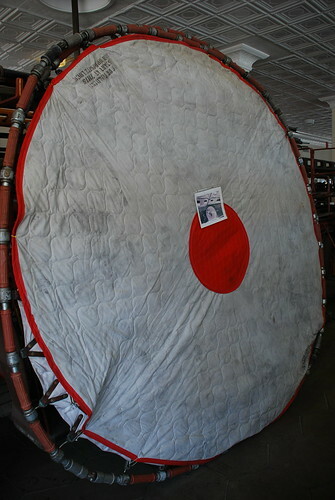 It pumped 700 gallons per minute as late as 1986. And, boy, is it packed with stuff. In fact, the museum’s so jammed, in order to get a full shot of some of the bigger pieces of equipment, you need a lens much fancier than what I’ve got. 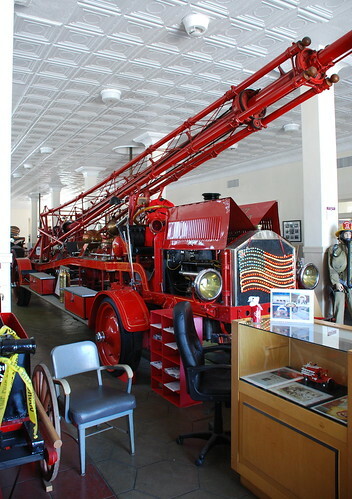 If you’re really into firefighting, you’ll need a good portion of the just six hours a week the museum’s open to see the things you’ll want to see. 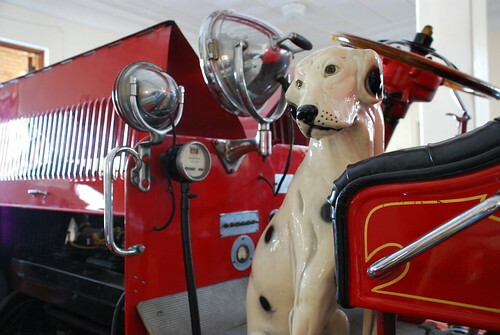 The museum’s William Rolland Educational Institute opened in 2003, thanks to a $250,000 donation from retired firefighter and Medal of Valor recipient Rolland. 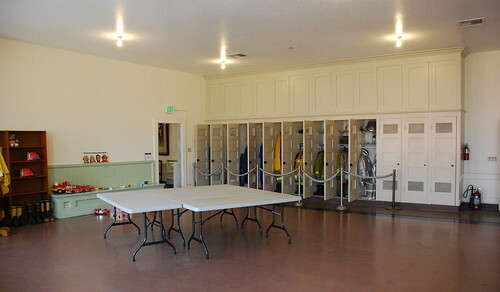 The Institute is used as fire safety learning center. Outside the Old No. 27, you’ll find the Fallen Firefighters Memorial. 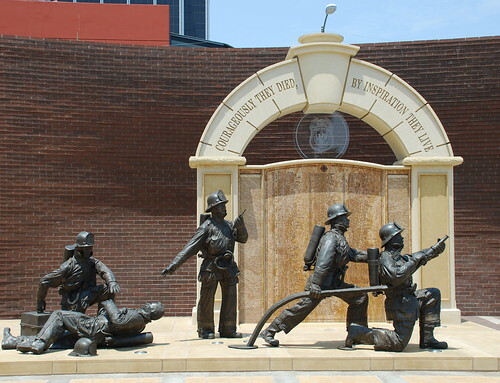 The monument features five bronze figures in front of a wall listing the name of every L.A. firefighter who has died in the line of duty since the department was founded in 1886. 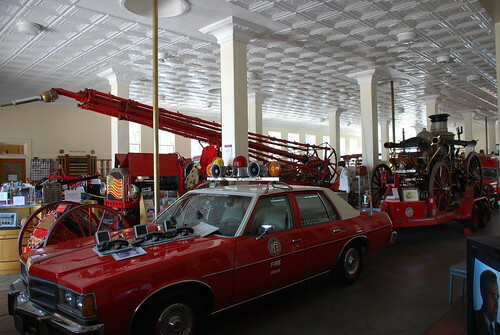 The statues’ concept is the design of L.A. Fire Captain Duane Golden. The plaza was designed by architect Michael Rotondi, and the limestone monument was designed and built by Yoshikawa. You want to go to the Memorial’s dedication? The completion of the Fallen Firefighters Memorial will be celebrated on Saturday, August 17, beginning at 11:00 a.m.
Firehouse No. 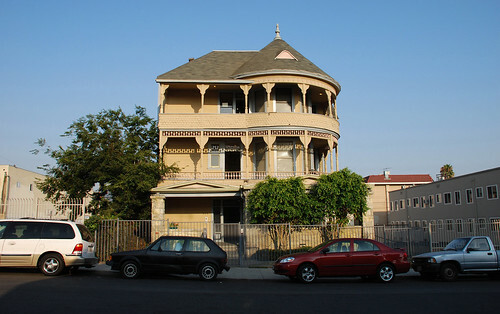 27 was placed on the National Register of Historic Places in 1985.